Shearer's have undergone yet another re-packaging process. They have re-positioned a number of flavors under a 'Savory' banner. This design is just as striking as the broad black sided bags that are now under the Kettle Cooked section. Each of these flavors have a dark green top and bottom with a color coded flavor sitting broadly between. 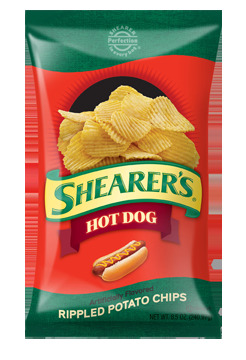 The name and flavor are given due prominence, there is a good graphic image of a hot dog and the Rippled Chips are on display. Nothing to fault, everything to praise. Generally speaking, Kettle Cooked Chips have a hard, brittle crunch and Regular Chips have a crispy, light snappy crunch. These Ridged Chips had a meaty, wholesome potato break. The crunch split the wavy seams as they turned into mush. The Rippled Chips inside were probably not quite as bright and light as featured on the packaging, but they were not far off. Made for dipping, these Chips had curved and sturdy edges, with not very much browning or visible seasoning. This is an odd one for us. Firstly, we can say there was definitely a taste of mustard in these Chips. Now it may be the name and picture on the bag, it may be the tricks the mind conjures, but to us, they tasted like Hot Dog. It may however, have just been a case of a flavor we had not tried before. We would urge any Hot Dog fan to try them to see what they think.